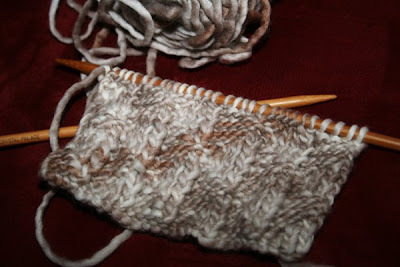 Next up, I'm trying an actual pattern with some of the wool from Linda. I really like how it's turning out so far, although you can't see the triangle pattern very well with the varigated yarn. oh, that is so nice! I really have to sign up for a knitting class myself. that is really nice! It looks soft and warm. Well done! Gorgeous orange scarf! I sure can see the triangle pattern in the new one you are knitting. You must be a natural at knitting. Cool pic-- you look so very UO! Lovin' that color! So cheery! 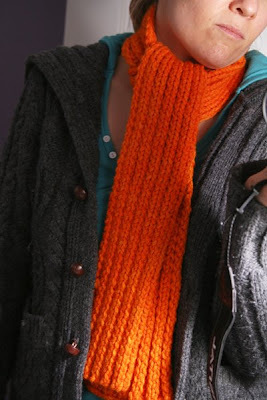 Your orange scarf looks beautiful Joy and wow, that triangle pattern looks stunning! It really has knitted up beautifully! Have a great weekend. I like the triangle pattern. The orange is a great colour. My knitting projects have all turned out a bit asymetrical. I love your scarf and the color.